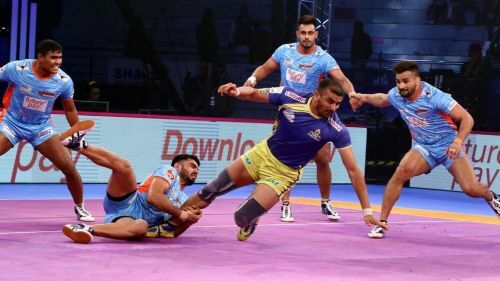 Ajay Thakur would look to inspire his team to a victory against the Bengal Warriors. The Kolkata leg of PKL 2018 commences with the home side, Bengal Warriors taking on the Tamil Thalaivas in a Zone B clash at the Netaji Subhash Chandra Bose Indoor Stadium in Kolkata today, Friday at 8 pm IST. The teams are facing each other for the second consecutive Friday, they had faced each other in Match 112 last week. The Warriors had come out on top in the match with a 28-21 win courtesy a stronger raiding performance against the Thalaivas. They had scored 16 raid points vis-a-vis the Thalaivas' 11 points. Maninder Singh (7 points) and, the substitute, Bhupender Singh (5 points) were the Warriors' top raiders on the night, whereas their captain, Surjeet Singh was the top defender for his side with 6 tackle points. Since the defeat, the Thalaivas have featured in a match against the U.P. Yoddha where the match ended in a tie (25-25). While their defense was again on point, especially Amit Hooda who scored yet another High-5, it was again their raiders who gave a sub-par performance on the night and could manage just 13 raid points. Athul MS who was given in an opportunity in the starting lineup failed to impress as he could score just 3 points off his 10 attempted raids. Sukesh Hegde's disappointing run continues as he was also out-of-sorts in the match and could manage just a solitary point off his 9 attempted raids. The two sides, Bengal Warriors and Tamil Thalaivas, have faced each other twice in the season so far, Match 10 and Match 112, and on both the occasions the Warriors have come out on top with a 36-27 and a 28-21 win respectively. When and where to watch: 20:00 IST on the Star Sports network and on digital streaming platform Hotstar. Catch the latest updates of the Pro Kabaddi Points Table here at Sportskeeda.